Browse this calendar for weekly classes, workshops, concerts and special events. Descriptions and registration options are listed below the calendar. We offer Yoga for Beginners Courses several times each year. Pre-Registration is required. Please visit the course page for details. This September yoga for beginners is open to everyone on a drop-in basis. Appropriate for students with a basic practice. ~ Explore basic alignment principles. ~ Basic pranayama (breathing) and meditation. and those who want to advance their yoga practice. ~ Practice intermediate backbends and prepare for inversions. ~ More detailed alignment instructions to refine your practice. ~ Continuing pranayama and meditation. Yoga Level 2: Intermediate+ and athletic students. Appropriate for students who have mastered intermediate poses. 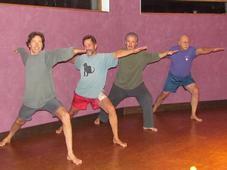 ~ Deepen, refine and strengthen your body with playfully serious poses. ~ Begin inversions and basic arm balances. ~ In depth alignment cues given to individual students. ~ Build precision and grace. Appropriate for people of any level of fitness. No experience needed. ~ Target main muscle groups with emphasis on increasing core power. ~ Set to music, this workout is fun, inspired and neighborly! ~ Appropriate challenges: rest when needed, non-competative atmosphere. ~ Mats and blankets provided (stretchy bands shared). ~ Please bring a stability ball and pair of hand weights. Appropriate for adults of all levels of fitness and all ages. No prior experience required. Singles welcome. Swing, Rhumba, Waltz, Foxtrot and more!! Dance lessons will resume in the late Fall on Sundays (4-5:30pm). 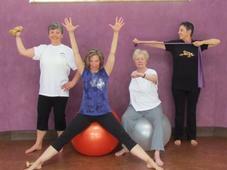 Contact Us to arrange a private group class. 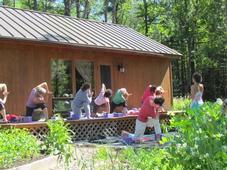 Therapeutic Yoga Classes & Packages - Click here. Energy Healing Sessions & Packages - Click here. For class card prices and online purchases click here. You may also purchase class cards in-person at our studio.